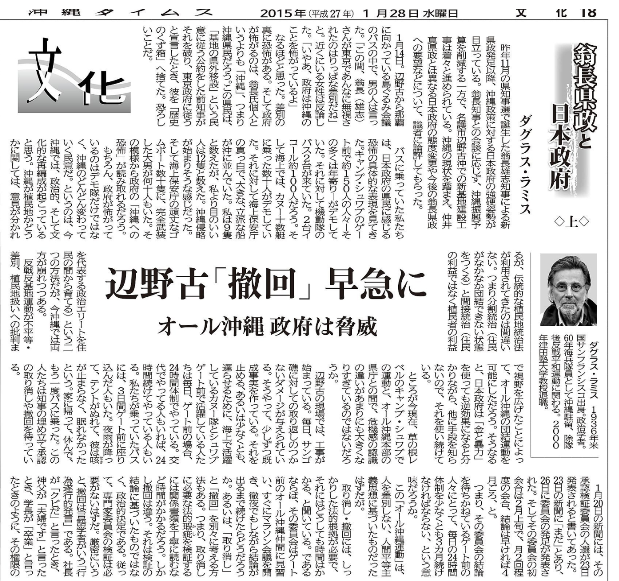 We write to you as representatives of the group of international scholars, artists and peace advocates from the United States, Canada, Australia, New Zealand, and Europe, who in January 2014 issued a statement opposing the plan to build a new base in Henoko and calling for a swift return of Futenma Air Station. We all have some connection with Okinawa through our research on aspects of Okinawan society, politics, and history, and over more than a decade we have been writing and publishing to the world articles on Okinawa in English in the online Asia-Pacific Journal – Japan Focus (http://japanfocus.org/). 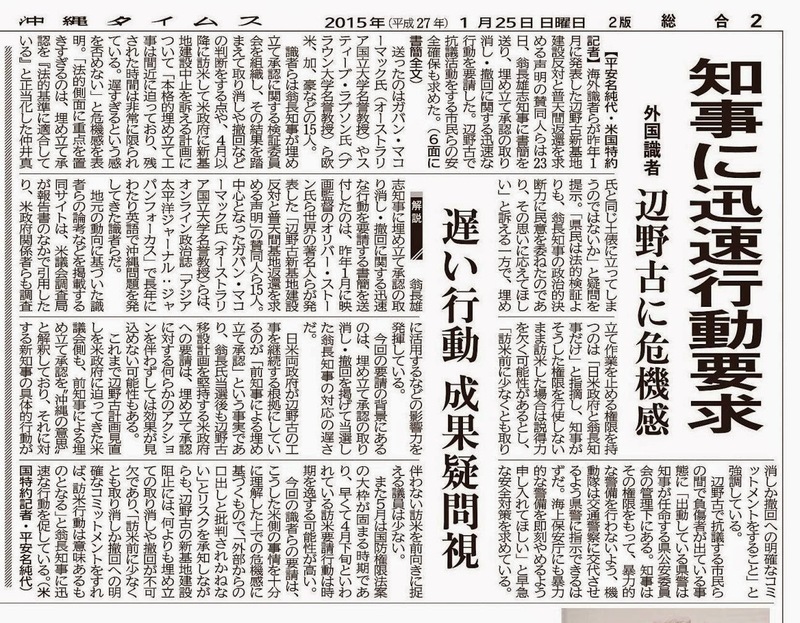 In our January 2014 Statement, we criticized the decision by former Governor Nakaima to turn his back on popular sentiment and agree to reclamation. We drew attention to the injustice of the heavy burden of military bases on Okinawa, and declared our opposition to the construction of a new base at Henoko. Then, in November, popular Okinawan sentiment against any new base was reaffirmed with your election to the Governorship, promising to “not allow the construction” of any new base at Henoko. 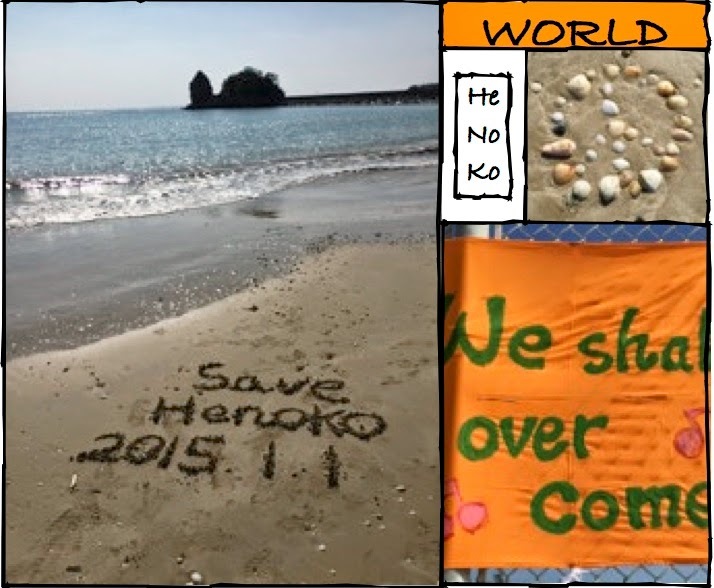 When you visited the site and declared your opposition to construction, it gave huge encouragement to those who had been so long engaged in unremitting struggle to save Oura Bay and Henoko. That was just over two months ago. Now we can scarcely bear to watch as preliminary construction proceeds at Henoko and as clashes between riot police and protesting citizens, often involving injuries to protesters, occur on an almost daily basis. We understand that the forces involved are Okinawan prefectural police, and that they are under the direction of the prefectural public safety committee appointed by you as Governor. It should be possible for you as Governor to make use of your authority to order those police forces not to use force against citizens protesting at Henoko. We urge you to order the immediate withdrawal of the riot police and their substitution by traffic police. We also ask you to call immediately for the Coastguard to cease its violent security operations. It is reported that you have decided to set up in late January a commission to investigate the decision to allow reclamation, which will then conduct its proceedings by meeting on a fortnightly basis and by April at the earliest report its findings: cancelation in the case of flaws being identified in the administrative process, or revocation otherwise. 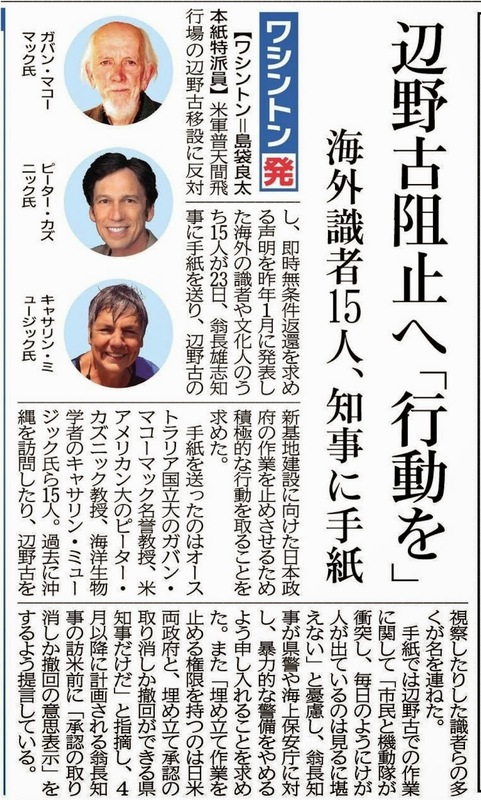 We also understand that in April or after, you are planning to lead a prefectural delegation to carry the Okinawan case against base construction directly to the Government of the United States in Washington. However, the main reclamation works are about to commence. There is little time. We fear it is becoming too late. Authority to stop the works rests with the governments of Japan and the United States and with you as Governor, who can either cancel or revoke the reclamation license. Should you not exercise that authority to cancel or revoke, there will be no point in your visiting the United States. But if your commitment to cancel or revoke is clear in advance of that visit to the United States, the visit then becomes meaningful and we would do whatever we can to support it. The people of Okinawa elected you their governor based on their sense that Okinawa must not be further discriminated against and that a base that would destroy the natural environment must not be built. 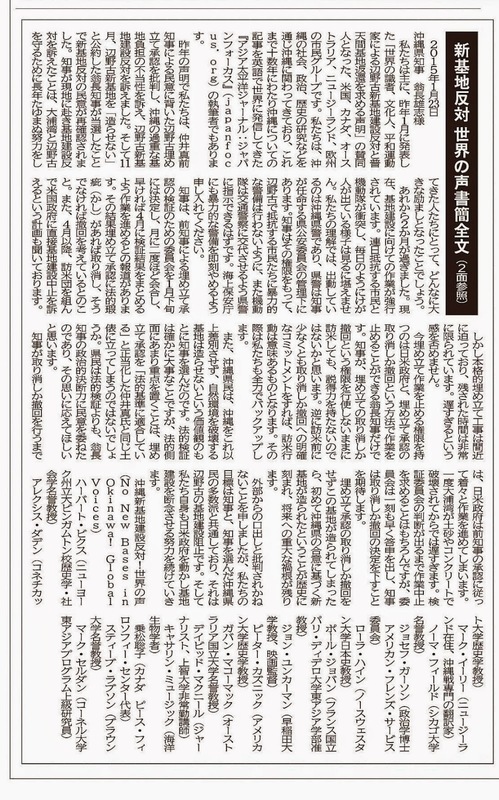 Scrutiny of the legal process is obviously important, but if the legal process is emphasized too much are you not adopting the same way of thinking as Mr Nakaima, who said that licensing of the reclamation was “in accord with legal criteria?” We believe that the people of Okinawa placed their faith in your political resolve rather than in investigation of the law. Until such time as you as Governor decide to either cancel or revoke, the government of Japan is steadily continuing its works in accord with the permission granted by your predecessor. If once Oura Bay is destroyed by the dumping of sand and concrete, it will be too late. We urge you to demand at once that the works be stopped pending the decision by the Investigative commission, and that Commission loses no time in making its recommendation, and that you then decide upon cancellation or revocation. If there is no cancellation or revocation and this base is actually constructed, it would mark the first time in history for a new base to be constructed with Okinawa Prefecture’s consent, leaving a dark stain for future generations. We may be criticized for expressing views from outside but our goal is the same as that of you, Governor Onaga, and the majority Okinawan people who elected you. 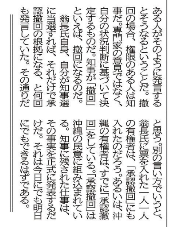 It is to stop the construction of a base at Henoko. We for our part intend to continue our efforts to have the Governments of Japan and the United States abandon base construction. 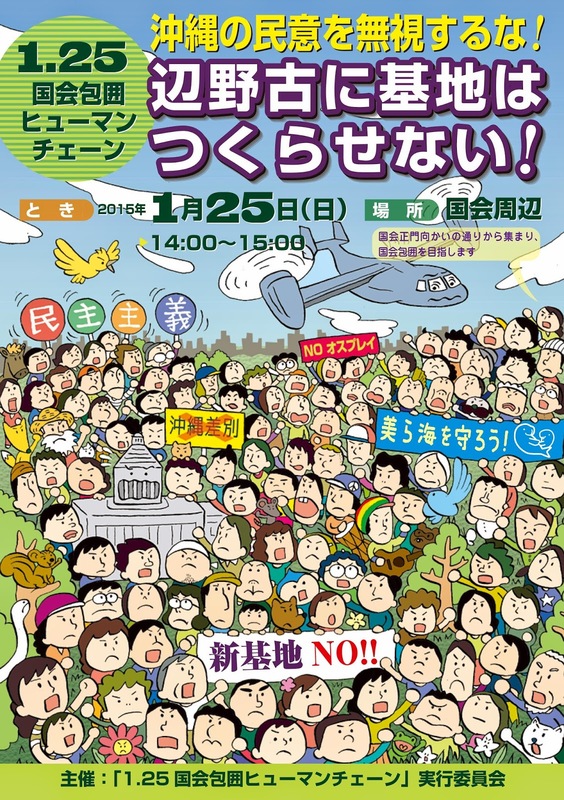 １月２５日午後２－３時「辺野古に基地はつくらせない！」国会包囲ヒューマンチェーン　A Human Chain action to surround the Japanese Diet Building 2-3 PM, Sunday January 25! Please see below Norma Field's invitation to join the "Women's Action for Peace." I wanted to let you know about an action planned for the afternoon of January 17, a week from this Saturday. It's the brainchild of a dear and respected friend, whose childhood years coincided with the war. Desperate from the events of last summer (passage of the state secrets law, for instance) and frustrated by mainstream media refusal to cover protest, she hit upon the idea of having women come together in the name of commitment to opposing war and encircle the Diet. Her inspiration is the Icelandic women's Redstocking movement--1975, when 90% of the women of Iceland took the day off from doing whatever they normally did, wearing red stockings. Did you know about this? I didn't. This will not literally be a "red stocking" day--they'll wear something red. 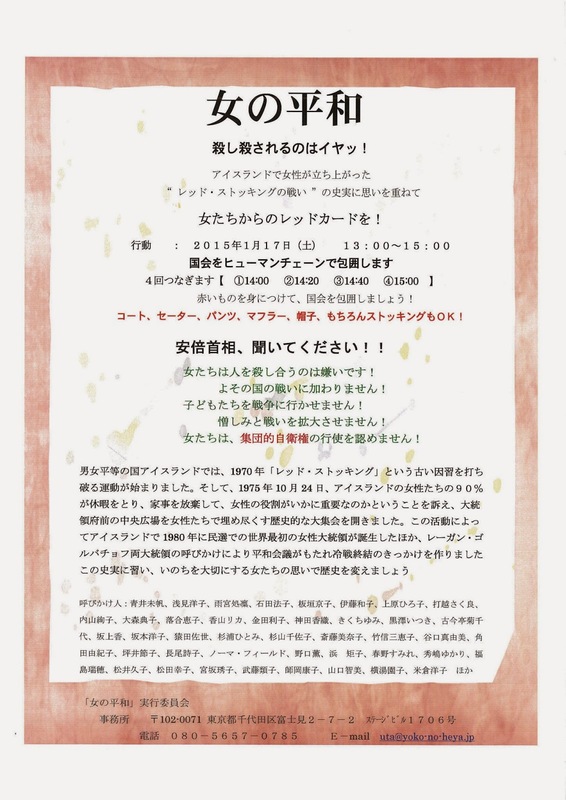 Women who can't attend are organizing events in Nagasaki and Sendai (so far), and others will get together as they can and send in photos. Men are encouraged to put on something red in solidarity, too (and that gives you a chance to explain why). 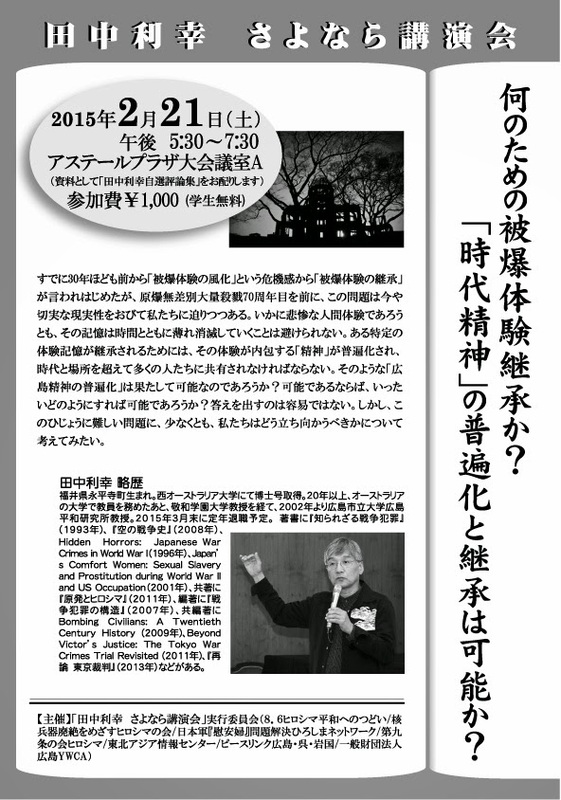 I'm attaching a flyer and Japanese and English versions of the short statement, "Why Women's Peace." Do you feel some hesitation, precisely over that? I do, always. I'm recalling the experience of trying to get a statement signed by "women of the University of Chicago" opposing the Gulf War. Two reasons I thought of appealing to the women-- not surprisingly, it was the staff, clerical workers, overwhelmingly female, who had family members directly affected, and belonging to a self-identified group of leftist faculty, I knew there would never be agreement on wording, for starts, till the proverbial cows came home if I appealed to that sector. Some of the women faculty of course brought up the objection to maternalism and the historical role of women's collaboration in war, but all of them signed (only one refusal, a courteous one, probably because of identification with Israel). 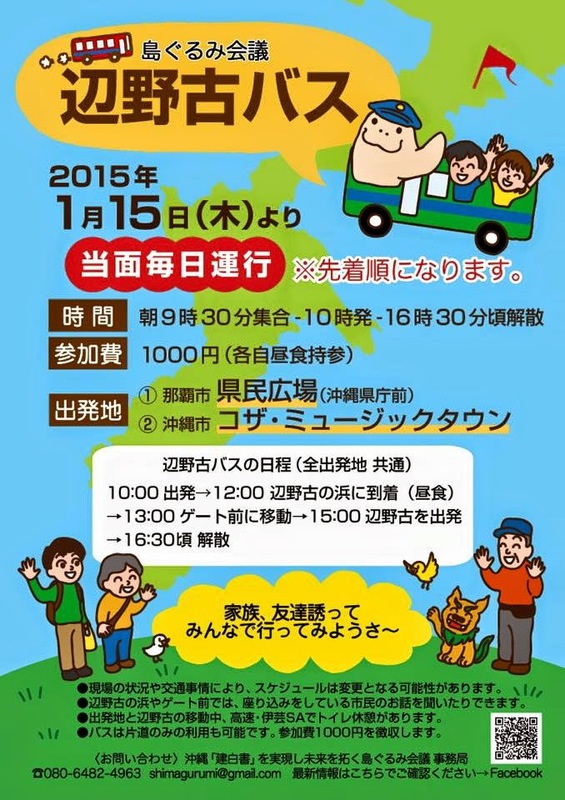 Those of you in Tokyo, please go if you possibly can. Please help spread the word.